Lama Tsering has just completed a visit to North America, where she gave three days of stories and teaching centered around her life with Chagdud Rinpoche. Here is the collection . 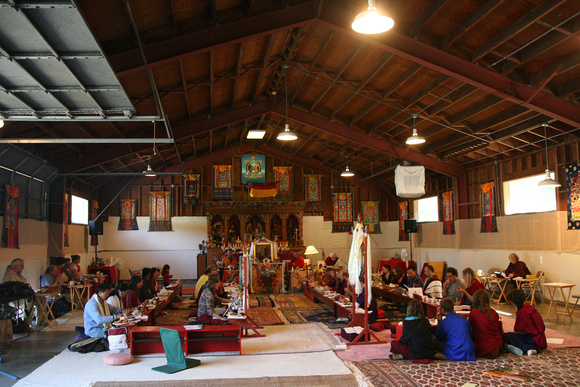 The annual Rigdzin Dupa retreat, the “Gathering of theVidyadharas”, (a terma of Jigme Lingpa) took place in the “new” shrine room at PPIAti Ling this year. As yet unfinished, and without windows or doors, it is open to the fresh summer breezes from the ocean nearby. We enjoyed having space to prepare tsok, and for kids to join us, playing at the back of the hall while we accumulated 100,000 tsok offerings. During breaks, we were delighted by beautiful weather and abundant flowers in the garden, and renewed the prayer flags that circle the garden. Encountering the very wrathful compassionate energy of Kunt’hup Gyalmo, the queen who is equal to all. Fearsome and energetic, her eyes bulging, she crushes to dust obstacles of broken samaya and random negative forces. May be viewed in high definition, full screen. Sound from T’hroma Nagmo by Chagdud Rinpoche. Red Vajrasattva drubchen, Rigdzin Ling. Lama Dancing during the Red Vajrasattva Drubchen at Rigzdin Ling.